The Exploris School, a charter school in downtown Raleigh, has acquired 5.5 acres near the Duke Energy Center for the Performing Arts. The property at 120 Kindley St. is home to a former Duke Energy data center that Exploris plans to renovate. The $20 million project is to be financed by bonds and a capital campaign. Exploris paid $4.4 million to acquire the property from Duke Energy. The site will allow the school to consolidate its elementary and middle schools on a single campus. Exploris Middle School is now at 401 Hillsborough St., while the elementary school operates out of trailers on New Bern Avenue. The elementary school will relocate in August 2017, while the middle school will move in December 2017. 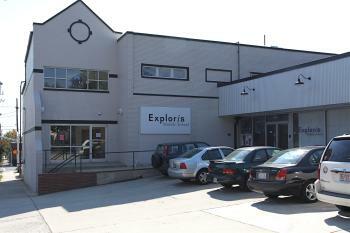 Exploris started as a middle school in 1997 and added kindergarten through fifth grade in 2014. The middle school has 218 students, while the elementary school has 206 students. The two schools will occupy 53,000 square feet in the renovated building's ground floor. The two floors above will be leased to commercial users and will be available in the future should Exploris need to expand. "Consolidating the elementary school and middle school campuses is a huge step toward financial independence for Exploris," Summer Clayton, Exploris' executive director, said in a statement. "We will be able to expand our collaboration with global education partners, local school districts and downtown Raleigh businesses." The city had envisioned possibly locating an entertainment and sports arena on the southern edge of downtown where the Exploris campus will reside. The project was included in a 10-year vision for downtown's future.